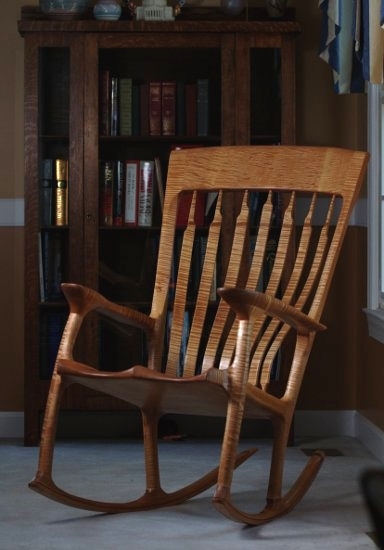 From the graceful curves of the rockers, to the eye catching grain patterns in the coopered headrest, my rocking chairs are as wonderful to sit in as they are to look at. The soft lines and smooth curves invite the admirer to explore every inch of the chair with their hands, amazed at how something so hard can feel so soft to the touch. These chairs become the center of attention in any room they are placed. These chairs are not your everyday, store bought rocking chair. The hand sculpting of the seat and arms cradle the body as it settles in and the design of the flexible back braces allows the chair to fit with a level of comfort not normally found in a wooden chair. Everyone is different, so these flexible back braces allow people of all shapes and sizes to enjoy my chairs. Chairs are available in sizes to fit everyone from 4′ 6” to nearly 7′! It would be my pleasure to build a chair for you. Please feel free to call me if you have any questions. What a great looking chair and I really admire your craftmanship. How long does it take to create one of these wonderful rocking chairs ? Thank you for the kind words. The first chair I built took about 100 hours. Subsequent chairs are now taking about 75 hours. I am currently working on an experimental chair using Spruce from the Rocky Mountains. Pictures should be up soon! Beautiful chairs. I’m very impressed with your designs.